Missing Mexican priest found alive with "notable signs of torture"
Two priests have been killed in recent months in the eastern state of Veracruz. A PRIEST WHOSE disappearance sparked protests in an eastern Mexican town was found alive yesterday with injuries consistent with torture, the Catholic church said. 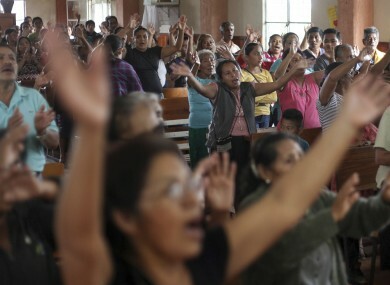 Father Jose Luis Sanchez Ruiz had last been seen on Thursday, and the next day the doors to his church in Catemaco, a town in the eastern state of Veracruz, had signs of forced entry. His disappearance sparked fears that he had suffered the same fate as two other priests who were found dead in Veracruz in September shortly after their disappearance. After his disappearance, townspeople blocked roads in protest on Friday night. On Saturday, protesters burned part of Catemaco’s municipal office and a police car. Sanchez Ruiz had received threats after complaining about crime in Catemaco. Mexico is one of the most violent places for priests in the world. In September, two priests were found dead on the roadside a day after they were taken away from their church in another town in Veracruz. Prosecutors have detained two people and say the priests were killed by acquaintances after an argument. That same month, another priest was found shot dead after disappearing in the western state of Michoacan. Fifteen priests have been killed in Mexico since President Enrique Pena Nieto took office in December 2012, according to the Catholic Multimedia Center, which tracks crimes against the clergy. Email “Missing Mexican priest found alive with "notable signs of torture"”. Feedback on “Missing Mexican priest found alive with "notable signs of torture"”.